This is one of the paintings that I am working on right now. 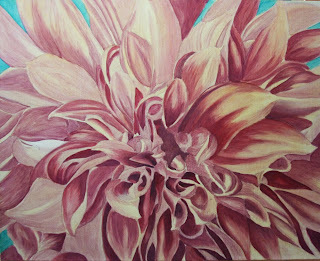 It is done on a 12x24" panel in oil. I was hoping to have it finished today so that I could submit for an upcoming exhibit but you just can't rush art! I still have lots of work to go but need to let each layer dry before adding more but it is really starting to take shape. The bottom area of the leaves will be pushed back more, similar to the top right area. Then of course more definition in the rest of the leaves to give the feel of space and shape. The orange layers of the butterfly are slowly being built up as well as the black areas on his wings. The orange is really starting to glow, I love oil! This two day workshop will help you to bring your drawings to a whole new level of realism and depth. The first day we will combine short demos followed by hands on applications of each technique. 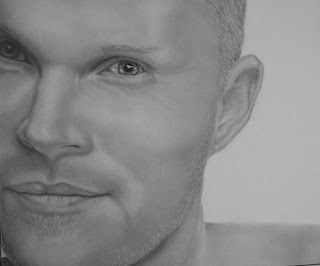 The second day we will apply these techniques create a completed portrait from your reference photo. Whether you are a portrait, landscape or still life artist your drawing skills will reach a new level of realism by the end of the workshop. A full supply list will be provided after registration. Again, if you are interested in this workshop, please don't wait until the last minute to register as spaces may run out. You can register directly at http://www.experienceit.ca/Activities/ActivitiesDetails.asp?ProcessWait=N&aid=3359 or contact me at info@stateofartportraits.com for more information. I am also working on several oil paintings as I am obsessed with oil paints right now so hard to get back into the mood for this one. I have it sitting in my living room to taunt me though so hopefully will get it finished before summer is over! 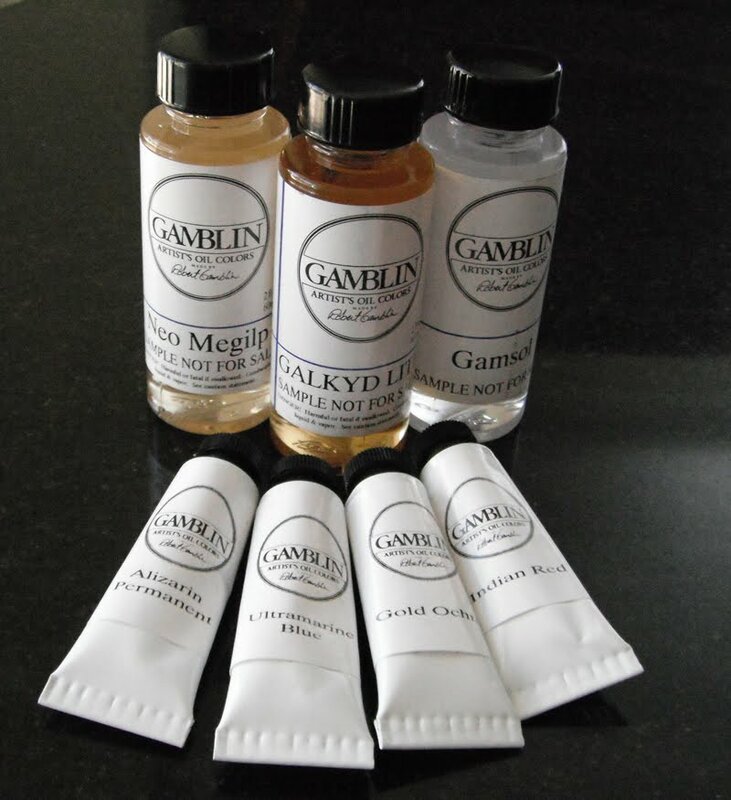 I was very pleasantly surprised yesterday to find a package waiting for me in the mailbox from Gamblin Oil Paints. I had spoken with their customer support team about one of their products awhile back and had asked them to send me some color and medium charts so that I could have a handy reference of the same in my studio. They also sent samples of Alizarin Permanent (my fav colour in all mediums), Ultramarine Blue, Gold Ochre and Indian Red. I realized after much fighting that due to my limited palette I was not achieving the color that I wanted for the beach grass and had an aha moment and dug through my studio for my 5 year old water miscible oils to see if the right color was there, and it was, cad yellow light. Although it was quite dry it still worked ok but sadly I had lost the beautiful glow of the under painting. I totally should have taken a photo as it was so beautiful, I surprised myself that it looked so nice :( Oh well, live & learn. Of course I knew something was still not right and looked at it this morning and realized that the grassy area had mysteriously ended in the middle of my canvas, not at all like my mock up which I deviated from in the heat of it all. So I will have to fiddle with the composition a bit and see where it ends up. 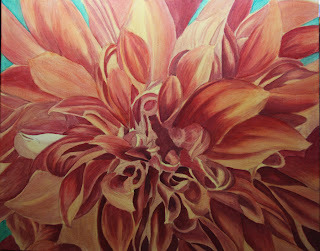 All in all though I am really enjoying oils and am quite happy with the way the colors are flowing together. I managed to get some time yesterday to paint (yay, starting to feel human again ;)) and I am happier with how this is looking now. I keep forgetting I am working in acrylics, not watercolor so I need to work from dark to light, not from light to dark. I spent many hours painting beautiful layers of the lights only to realize later that of course they need to be covered up as they are too transparent in the acrylics. 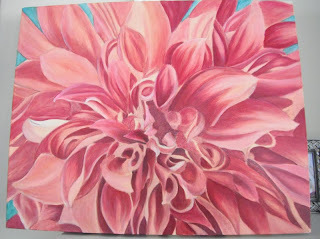 With watercolor, this technique works great as even though the layers are transparent, they still end up covering the substrate enough to create a great deal of depth. I found with the acrylics that no matter how many layers I was applying of the lights, while it looked nice, it just was not giving me the level of coverage that I was after. So I added several layers of mid tones and a bit more of the darks blended in and I am liking the coverage much more. The darks have been established throught the painting now and will just add the darkest darks after I finalize the midtones and the highlights. I am slowly (VERY SLOWLY as have not been able to get into the studio much lately) building up the layers to create a more translucent look. 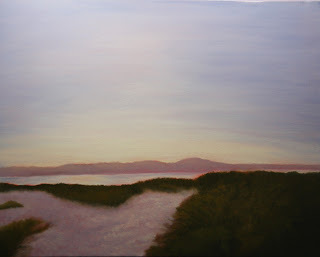 Hopefully next week I will be able to get back to painting every day, I am getting twitchity! I got my free sample of the latest water miscible oil on the market, Cobra. I have not had much time to paint lately, hence all the thinking about painting and studio tips :) Soon, soon! I am quite liking the regular oils and see no reason to use the water miscible oils but can't help but try the samples :) If handled properly regular oils are not nearly as scary as I thought they were going to be (toxicity and cleanup wise). By turning my fan on low in my studio and keeping solvents/paints in covered jars I do not have any fumes or odours. Many artists do not even use solvents at all but I like how it thins the paint. I also started covering my palette when not in use which makes a big difference as I was leaving unused paint on my palette between sessions. 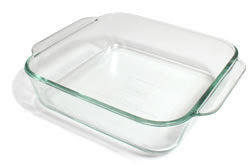 So I grabbed yet another dish from the kitchen for my palette, similar to the one below. It has a rubber type lid which keeps the paint fresh similar to using a stay wet palette.